Bones, ligaments, hearts and lungs, are all exposed for your personal inspection at Chicago’s Museum of Science and Industry. Plastinated human remains, which were voluntarily donated to this scientific cause, sit perfectly preserved on platforms and in clear casings for anybody’s wandering curiosity. It’s an exhibit of body parts and whole figures and is better known to the public as Body Worlds. 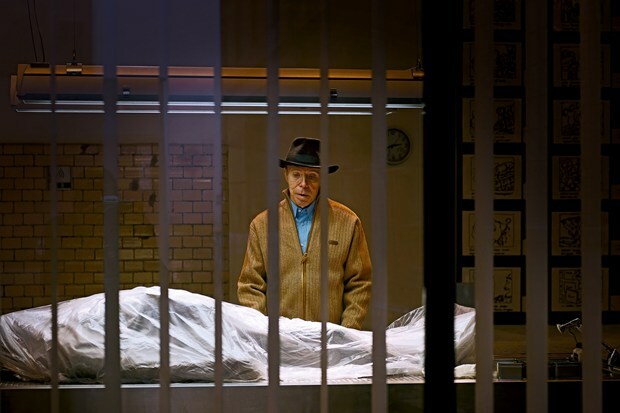 The idea to use human bodies as an exhibit came from one German man, Dr. Gunther von Hagen. Hagen turns flesh into plastic through plastination, a process he invented that replaces the deceased’s natural fluids and fats with an infusion of plastic and rubber polymers, as a way to preserve anatomically correct specimen for research. What was once a decomposing body, can now become a durable, odorless plastic being. His technique has been in demand around the world for the last 18-years. 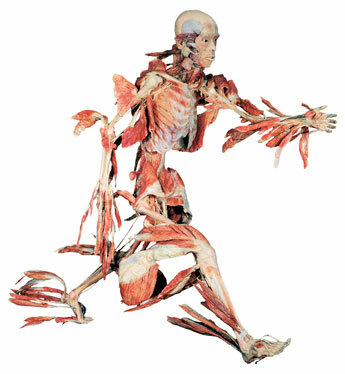 Body Worlds is hanging out in Chicago from February 2nd – September 5th. Attendance has proven it a phenomenal success with more than one thousand visitors taking the tour every week, according to staff. Curious individuals, groups, and field trips can spend the day witnessing the functions of a severe aneurism, a bad case of lung disease, as well as what a brain tumor actually looks like on human tissue. There are various points of interest throughout the tour. Showcases near the entrance introduce basic muscle, ligament, and bone matter. As you move on, bodily organs lay for examination under glass and, for those brave enough, there is an information booth near the end of the exhibit where you can touch actual lung and kidney tissue. Body Worlds encourages floods of curiosity. Inside, you feel compelled to study everything at once so make sure to pace yourself and focus on what’s in front of you. At first, you’ll ease into the exhibit with glass casings containing various arm and hand bones. Just beyond that, are other cases with leg bones, hip bones, and joints on display. Alongside these tables, lurking in dim spotlights, are skeletal figures standing tall on platforms. The full body displays are dissected in a progression which leads you to the next phase of the exhibit portraying muscle coordination. There are more than 45 human figures throughout the show and each, like the weight lifter waiting just past the front entrance, have been precisely sliced up in order to draw your attention to what Hagen is emphasizing. He took care when slightly stretching the weight lifter’s muscles away from the skeleton’s frame, permanently leaving some muscle and skeleton partially together, and some side-by-side for comparison. The casings next to the muscleman contain other specimens for comparisons. You’ll look between healthy hip bones and their visibly shiny manmade metal counterparts. And we all know the hipbone’s connected to the leg bone so as you’d expect, just past these showcases you will confront a full figured man preserved as if he had been in the middle of a race. Unlike the muscle man, the runner’s muscles, which he generally would use during a run, were only halfway dislocated from the skeletal frame and frozen in place, as if they had been churned up in the wind behind him. A fascinating group of displays following the runner exposes you to your first glimpse of what a brain tumor can do and how it looks. Hagen sliced brain matter into thin and translucent slices in order to give you a layered view. This method makes it easier to spot hollowed cavities in the brain-center resulting from massive tumors, blood clots, hemorrhages, and so on. Another slice of brain matter shows exactly what the differences are between a healthy brain vs. one with Alzheimer’s’ disease. You will see how a brain with a tumor suffers from a large hollowed cavity burrowed in its’ center where as Alzheimer’s visibly deteriorates the very tissue of the brain, like a piece of bad fruit. The most talked about part of the exhibit is the side-by-side comparison of the smokers vs. non-smokers lung. From this writer’s observation, the smoker’s lung had a moldy appearance whereas the non-smoker’s lung had a pearly white gleam. The smoker’s lungs literally looked like bread with a ton of mold, even throughout a cross section. The tour’s final showcase stokes ethical and personal controversy over the whole cadavar of an unknown pregnant woman, which is perfectly dissected revealing a preserved 8-month fetus curled up inside. The mother lays on her side, hand supporting her head, in a relaxing gaze. It’s hard to imagine how a person like this came to this exhibit, and looking into her backstory doesn’t clarify the mystery. The expecting mother’s identity, as well as a handful of other plastinated bodies used in examples of procreation, have been questioned since Hagen’s supply of corpses were linked to Chinese political prisoners, in 2004. Because China doesn’t execute pregnant prisoners, speculation potentially links the deceased as a mistress of a Chinese leader. Hagen admits he personally doesn’t always know who donates bodies to him because he’s trusted assistants to make ethical arrangements on his behalf. Preceding the mysterious pregnant woman, Chicago’s exhibit leads you through a shrouded area, separated from the rest of the exhibits, which sets the stage of fetal life. In the foreground there are cases and jars which contain embryos at almost every stage from first trimester to the last. In a somewhat related story, the theft of a 13-week fetus on display from the final days of Body Worlds II, in Los Angeles, made news recently. The thieves were two women caught on camera who, as of yet, have not been apprehended. Despite the controversy, there are shows in many cities across the world. The show was developed to educate through revealing the human body and as many of its functions possible, including pregnancy and development. Visits are intentionally mapped out from muscles, human tissue, and physics, to disease, death, and reproduction. Body Worlds is one of the most profound exhibits of science and medicine with over 16-million visitors, worldwide. The Chicago exhibit runs from February 4 – September 5 amd the museum offers both audio and readable tours for various ticket prices.